A childminder has turned plastic litter found on a beach into poppy artwork for Remembrance Day. Thira Lane, 47, from Mersea Island, Essex, has a passion for recycling and has previously created igloos and model seagulls from household waste. 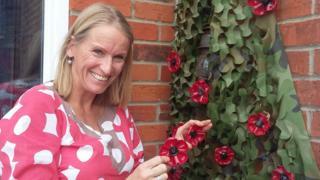 Now she has used drinks bottles to create poppies to mark the centenary of the end of World War One. She has been praised by Ofsted for her use of artwork to engage youngsters in her 14 years as a childminder. Ms Lane said her greatest achievement was an igloo made from 700 milk cartons, found on the island near Colchester. "Volunteers are always clearing rubbish and some of it is useful," she said. "I have made seagulls from waste cardboard and sacking, and people from across the island collected milk bottles for me to make the giant igloo." Mums at West Mersea's primary school have also taken up Ms Lane's idea and are also turning the bottoms of plastic bottles into poppies for the Royal British Legion's annual campaign. Remembrance Day will be also be marked elsewhere on the island with displays including soldier silhouettes, known as "Tommies", decorated with candles and crocheted poppies.